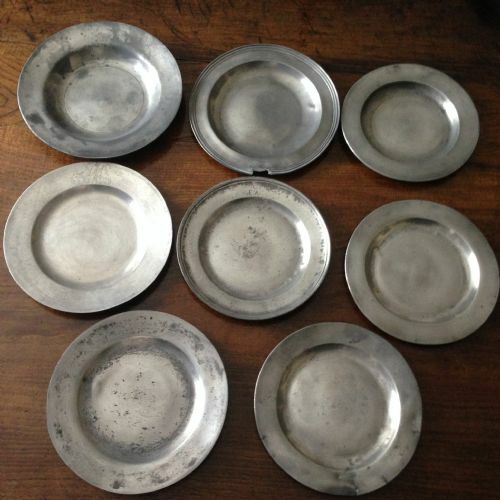 Eight pewter plates, 1680 - 1800. An assortment of pewter plates, triple reed, single reed rims to plain rims, dating between 1680 and 1800.
two with owner's initials to the rim. Two of the plates are damaged..a triple reed has a piece missing to the rim and a plain rim has three cracks to the rim. Most of the plates have touchmarks and hallmarks to the back. SIZES: 9.25 inches to 10.50 inches. PROVENANCE: The Blue Boar Hotel, Maldon, Essex. NOTE: if viewing on www.royprecious.co.uk if you go to www.sellingantiques.co.uk/rp you will be able to see more images and have a zoom facility. 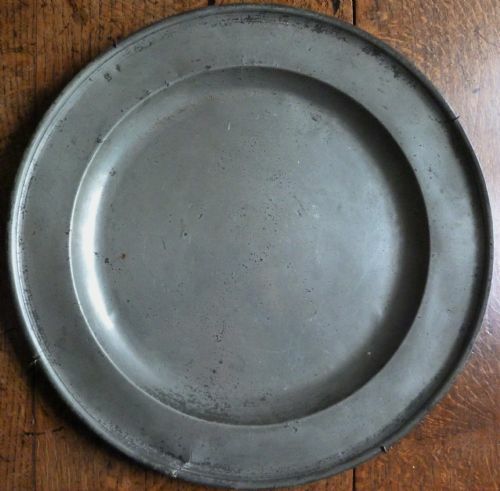 A large Queen Anne or George I singlr reed rim pewter charger, 18 inches in diameter. Original owner's initials to the rim, E.B.(?). PROVENANCE:The Blue Boar Hotel, Maldon, Essex.